Want to Be More Productive? Start Your Day the Right Way! I’m an early bird. This has been a forced transition (forced being, I’m a mom and sleeping in becomes an impossibility once you have children). Getting up early allows me to tackle my day before my day tackles me. The one item that gets me through my day is MY PLAN. I would be lost without my daily planning time. I’ve experienced days without it and ended up frittering my time away on trivial tasks. However, my planning isn’t just in the morning. Every Sunday, I write out a block plan of my week. I like block planning because it’s not as restrictive as hourly planning. I have three key time blocks in the day (morning, afternoon, and evening). Within each of these time blocks, I schedule up to three tasks. By dividing nine tasks into three parts of the day, I’m more likely to get all my to-do list items done. Then, every morning during the week (Monday to Friday), I reference my time block sheet and plan out my daily activities in more detail. I note a top priority of the day (which may be a particular event or appointment I have to book). Then I schedule my essential tasks and document our menu. I even have a place where I write a scripture or an inspirational quote for the day. Get your daily planner and weekly block planning sheet today! 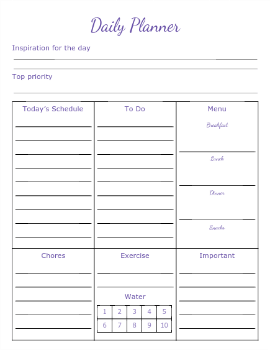 All you have to do is scroll to the bottom of this post and download your daily & weekly sheets! Do you plan out your days? What does your morning routine look like? 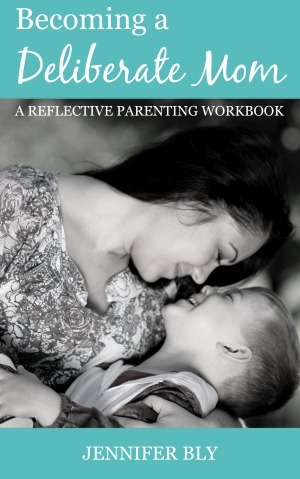 These daily and weekly planning sheets for mom are a lifesaver! 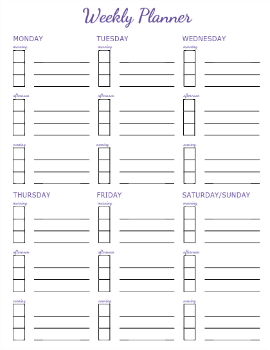 Plan your weeks and manage your busy days! I love my morning routine – and the time block planner is awesome – it’s my favourite way to plan my days. I wake up super early and it doesn’t help to have a now 4 year old (she celebrated her birthday yesterday) who wakes up as early or even earlier than you do. I try and plan my day but it doesn’t always go according to plan. I will have to use your planner to help make my day go a little bit easier. Here’s to an amazing week your friend? My youngest went through a phase (last month) of getting up at 5:15/5:30. It was awful and you’re right – there’s no way I’m getting up earlier to beat that. Fortunately these things are always a phase and it passed after a couple of weeks. I love using my planning sheets – time block planning is my FAVOURITE! I’m somewhat of an all or nothing person. It’s either due diligence or chaos. So yes, I do plan out my days! It’s a new thing for me. I’m not an early riser, though. I don’t think I ever will be, but I have those late morning hours after I drop the kids at school and that’s my glory time! Then by 3-5pm, I’m ready to drop. I’d love to try the glass of warm lemon water! Due diligence or chaos… lol are we related?! I swear everything spins horribly out of control when I don’t plan. The glass of warm lemon water does a big kick to your immunity and metabolism (so I heard from reliable sources *cough* Dr. Oz). You should give it a try. Such a brilliant idea to time block! I’m an early riser too- it helps so much. But I love the idea to time block. Time blocking has revolutionized the way I plan my days. I mean, it’s so much easier to say I need to get these three things done in the morning, these three in the afternoon, and these three in the evening. I never do more than three per time block and I repeatedly get everything (or close to everything) done in the day. I encourage you to give it a try! I wake up early, but not early enough. I know I should probably add on another 30 minutes, because I think that would sincerely help. I’m finally planning in a planner, so I’m hoping that will help in 2016. :) Thanks for sharing your tip. I love getting up early – it really helps me start my day right! 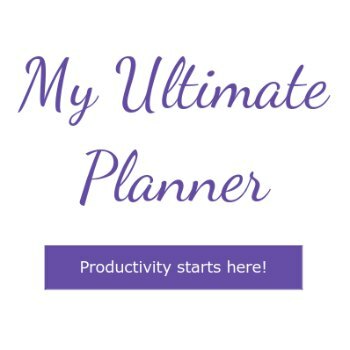 I couldn’t survive without my planner… lol – it’s my compass! See, my problem is that I’m not always organized. I’m working on that. And I don’t do it all either! I’d go crazy if I did. lol – well it’s okay if you’re not organized… try time block planning. It might be the thing you need! I’ve finally gotten back into a good routine and it feels so good. Starting my morning off right really sets the tone for my day. 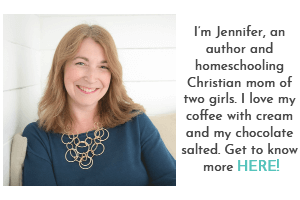 Great planning printable Jennifer! A routine always helps me feel better and sometimes it takes a while to get a rhythm that works. I’m glad you’ve found something that works for you! Oh I love the planner! Thanks! I am an early bird, but unfortunately so is my toddler. That means I get zippo done during my most productive time and have to try and work my overtired brain at night. Dang toddlers :) Someday she will be older and will enjoy sleeping in with the rest of her siblings! Hopefully…. LOL I read your comment and had to chuckle. Murphy’s Law – I published this post and my daughter started getting up at 5:15/5:30. I want to cry. Fortunately I know it’s a phase. It’s a phase… it’s a phase. That’s what I have to keep on telling myself so I can get through the long, long, days! I’m delighted you liked the planner – enjoy! Sometimes *often* I wish I could be Type B. I’m delighted you like the printables. The block planning is awesome Tawnya – try it out when you have a chance. I’m struggling with the early rising lately due to a teething baby, but when I do pull it off my days go much smoother! I love the idea of block scheduling and will have to give it a try! Block scheduling has helped me so much! I encourage you to try it! I am a planner but I am NOT an early bird! Well, I am because I have to be, but I don’t function well in the morning. I have a giant dry erase calendar not he wall in my office. It’s got the whole month on it, but I like the idea of breaking it down daily. I love the sounds of your dry erase calendar! I love things like that! Yes, I prefer a daily plan (and the block planning – 3 items, 3 times a day) really helps me get through my to-do list! You’re so good! I wish I could chunk my time and be this productive. Maybe I’ll give it a whirl! Thanks for sharing! Oh Ann, I encourage you to try the block planning. I find it much easier to achieve my goals than by focusing *eyes glazing over* a big to-do list! I’m obsessed with planners, Jennifer. I absolutely love to sit down on Sunday night and plan for my week too. This is such a great tip you’ve shared. I also plan out a daily schedule every morning, or sometimes the night before, but it is a necessity either way. My husband always tries to get me to move to an online calendar but I can’t live without my paper planners :). There’s a big difference to me. It sounds like your planning sessions are a lot like mine. I couldn’t do an online planner either. I need the paper! Okay, I really like the idea of having 3 chunks of a schedule – morning, afternoon, and evening. And focusing on fewer things. When I write out to do lists, they overwhelm me because I feel like I have to get it all done! Block planning is AMAZING! Seriously, it has revolutionized my life. I can’t stand the big to-do list anymore… block planning is the way to go! I hear you Jeremy, my husband is fortunately a list maker too. This is survival 101 (or something of that nature). I seriously can’t get through my day without a list (and referencing it several times). My days changed drastically when I started getting up before my daughters. I love the morning time that I have before they wake up! I don’t have a consistent plan every morning and don’t typically time block my mornings. I find morning routines interesting and reading yours made me consider if I should time block more mornings. I do find it helpful to write my list the evening before of what I want to do right away in the morning. It’s so helpful (most days!) to keep me focused in the morning. Time blocking has been my trick to feeling accomplished. ;) Give it a try – it just might be the thing you need. Good point about staying away from online stuff. I’m the same way. Once I’m online the time just melts away! Thanks for sharing your thoughts on planning for productive days Wendy. Yes! I love feeling like I’m tackling the day (rather than the day is tackling me). I’m insanely un-organized! It’s probably not that bad . . . I make lists and work through them all the time. I even set up schedules for myself, but get interrupted so routinely by 5 people that I find it hard to maintain them! I’m working on being more of a morning person (though it’s not easy to stay ahead of the early birds!) and keep seeing things about the benefits of time block scheduling. I’ll be printing these sheets out to give it a try. Thanks for the encouragement. You’re an inspiration, Jennifer. Yes, interruptions can be challenging. When I do blog work, I try to schedule it for a time when there are no interruptions (ie. the kids’ rest time or after they are in bed). I can deal with interruptions while cleaning and cooking but for some reason, I can’t handle them well when writing. 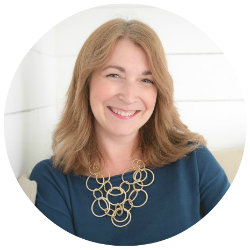 I’m delighted this encouraged you – please try the block scheduling. It’s helped me tremendously. After reading your post and then each of the comments I had to smile. Everyone is so young! When I was in that age group I homeschooled my kids, ran my own business, traveled as a public speaker, managed our farm when my husband was on the road, etc. Now that I am 70 I cannot believe that I am considerably busier than I was back then. I am on the road about 7 speaking gigs a month, manage two retail stores, have my own bi-weekly talk show, write for 2 blogs, have two on-line businesses, make all our food from scratch, do the bookkeeping for all the businesses and my husband is disabled from an accident. People can’t figure out how I do it especially when I have dinner parties etc — I smile and tell them I wrote a book on it — and I did LOL. When you are organized you are rarely frustrated — so my hat’s off to all of you who are daily planners. Keeping organized definitely helps when we have schedules that are overflowing. Thanks for sharing your thoughts on this Carol. Awesome way to plan, Jennifer. I like the idea of 3 blocks to the day and 3 tasks for each time block. 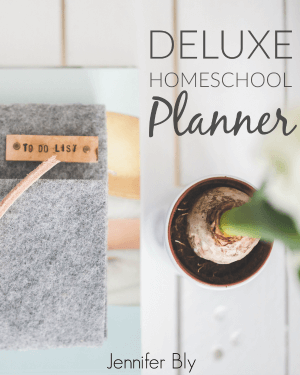 I get tripped up when I try to plan things hour to hour because even though I have only one home schooler now, it’s hard to plan what her needs will be while she studies. My morning starts off like yours. (Except I need more time for prayer and Bible reading because I probably have ADD and can’t focus too quickly in the morning!!!) I do get a half hour of writing into my morning before home school, which helps me stay on track and get off to a good start for days I need to write. The block planning has worked wonders for my productivity. I found the hourly plans to be overwhelming and discouraging. I love starting my day with the Lord — and exercise — so awesome! I’m a trained morning person, too – thanks to kids. I love being organised but I’ve never been good at keeping a planning system working, until I started a bullet journal six months ago, and I’m still using it! I now write my plan for the next day before going to bed and then look at it again in the morning. It isn’t fool proof though, so I might include some of your ideas. The block planning and the top priority for the day would help me to focus on what was important and schedule it. I’ve heard so much about bullet journal planning! It sounds like you have a fabulous system. 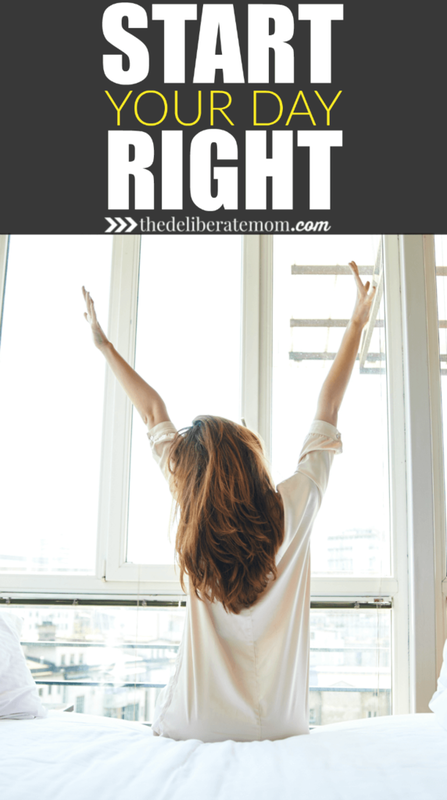 I like the idea of planning the night before – I’m usually wiped by the end of the day but maybe if I sat down and did that right after the kids go to bed, that would be helpful too. I like having a priority for the day – if I do that one thing, I feel better!